Maintaining high standards of business ethics and corporate governance has always been one of the Group's prime tasks. It believes that conducting the Group's businesses in an open and responsible manner and following good corporate governance practices serve its long-term interests and those of its shareholders. Rigorous standards of corporate governance enhance the Group's accountability and transparency, earning the confidence of its shareholders and the public. The Company has complied with the code provisions of the Corporate Governance Code (the "Code") as set out in Appendix 14 to the Rules Governing the Listing of Securities on The Stock Exchange of Hong Kong Limited (the "Listing Rules") throughout the year ended 30 June 2018, except that there is no separation of the roles of chairman and chief executive. The Board of Directors of the Company (the "Board") continues to monitor and review the Company's corporate governance practices to ensure compliance. 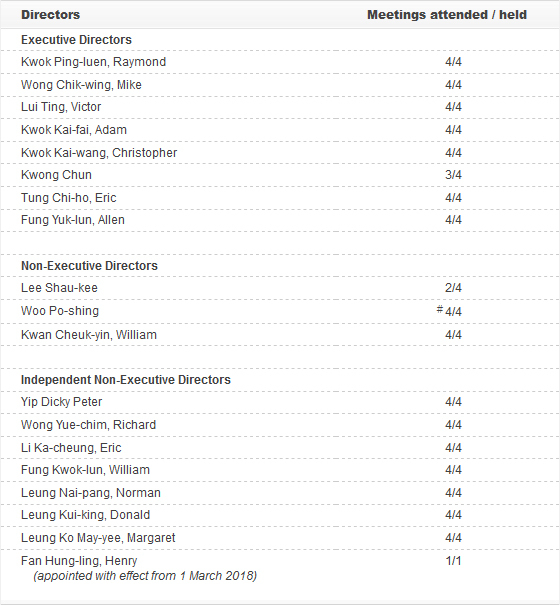 An updated list of Directors identifying their roles and functions (the "Directors List") is maintained on the websites of the Company and Hong Kong Exchanges and Clearing Limited ("HKEx"). Independent Non-Executive Directors are identified as such in the Directors List and all other corporate communications containing the names of the Directors. Prior to the implementation of the code provision in the Code on board diversity in September 2013, the Company adopted a board diversity policy (the "Diversity Policy") setting out the approach to achieve diversity of the Board members in June 2013. The Company is committed to equality of opportunity and does not discriminate on the grounds of race, gender, age, disability, nationality or any other factors. It also recognizes and embraces the benefits of diversity in Board members. The Company sees diversity as a wide concept and believes that diversity of Board members can be achieved through consideration of a number of factors, including but not limited to background, age, gender, culture, industry experience, skills and knowledge, educational background and other qualities. The Company takes into account these factors based on its own business model and specific needs from time to time as well as the availability of suitable candidates in the market. The Nomination Committee monitors the implementation of the Diversity Policy and reviews the same as appropriate. The Board believes that the balance between Executive and Non-Executive Directors (including the Independent Non-Executive Directors) is reasonable and adequate to provide sufficient checks and balances that safeguard the interests of shareholders and the Group. Non-Executive Directors and Independent Non-Executive Directors provide the Group with diversified expertise and experience. Their views and participation in Board and committee meetings bring independent judgment and advice on issues relating to the Group's strategies, performance, conflicts of interest and management process, to ensure that the interests of shareholders are taken into account. The Company currently has eight Independent Non-Executive Directors, representing more than one-third of the Board, and at least one of them has appropriate professional qualifications or accounting or related financial management expertise. The Company has received from all Independent Non-Executive Directors their confirmation of independence pursuant to the independence guidelines set out in Rule 3.13 of the Listing Rules (the "Independence Guidelines") and considers that they are independent. Mr. Yip Dicky Peter and Professor Wong Yue-chim, Richard, both being Independent Non-Executive Directors, have served the Company for more than nine years, and will retire and being eligible, have offered themselves for re-election at the forthcoming annual general meeting of the Company (the "AGM"). The Nomination Committee considered that their long service will not affect their exercise of independent judgment and was satisfied that each of them has the required integrity and experience to continue fulfilling the role of an Independent Non-Executive Director. Taking into consideration the above and the confirmations on the Independence Guidelines made by Mr. Yip Dicky Peter and Professor Wong Yue-chim, Richard, the Board is of the view that both Mr. Yip Dicky Peter and Professor Wong Yue-chim, Richard remain independent notwithstanding the length of their service and should be re-elected at the forthcoming AGM. In accordance with the Code, the re-election of Mr. Yip Dicky Peter and Professor Wong Yue-chim, Richard will be subject to separate resolutions to be approved at the forthcoming AGM. The Board meets at least four times a year, and a tentative schedule for regular Board meetings for each year is provided to the Directors prior to the beginning of each calendar year. In addition, at least 14 days' notice of all regular Board meetings together with the meeting agenda is given to all Directors such that all Directors are given the opportunity to include matters for discussion in the agenda. Meeting agenda and accompanying meeting papers are sent to all relevant Directors at least three days in advance of every regular Board meeting and committee meeting. 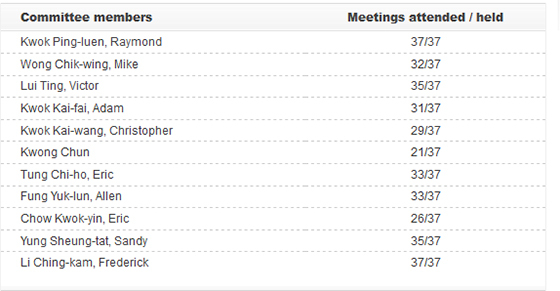 Directors may participate in meetings in person, by phone or by other communication means. Between regularly scheduled Board meetings, Directors may approve various matters by way of passing written resolutions. Additional Board meetings may be convened, if necessary. Directors are required to declare their interests (if any) in the matters to be considered at the Board meetings in accordance with the articles of association of the Company (the "Articles of Association"). Should a potential conflict of interest involving a substantial shareholder or a Director arise, the matter will be dealt with by a physical meeting rather than by written resolution. Independent Non-Executive Directors with no conflict of interest will be present at meetings dealing with such conflict issues. Pursuant to the Articles of Association, a Director who is considered to be materially interested in the matter shall abstain from voting on the resolution approving such matter. Directors must keep abreast of their collective responsibilities. Each newly appointed Director or Alternate Director would be provided an induction package containing an overview of the Group's businesses and the applicable statutory and regulatory obligations of a director of a listed company, and would receive briefing on the responsibilities under the declaration and undertaking with regard to directors from an external lawyer of the Company. The Group also provides briefings and other training to develop and refresh the Directors' knowledge and skills. The Group continuously updates Directors on the latest developments regarding the Listing Rules and other applicable legal and regulatory requirements to ensure compliance and enhance their awareness of good corporate governance practices. Circulars or guidance notes are also issued to Directors and senior executives where appropriate to keep them abreast of any latest changes in applicable legal and regulatory requirements and corporate governance practices. The Company follows the Model Code for Securities Transactions by Directors of Listed Issuers in Appendix 10 to the Listing Rules (the "Model Code") as the codes of conduct for the Directors and the relevant employees who are likely to possess inside information of the Group (the "Relevant Employees") in their dealings in the Company's securities. Before the Group's interim and annual results are announced, notifications are sent to the Directors and the Relevant Employees to remind them not to deal in the securities of the Company during the blackout periods. In response to specific enquiry made by the Company, all Directors have confirmed that they have complied with the Model Code during the year ended 30 June 2018. The Board directs and approves the Group's overall strategies. Given the diversity and volume of the Group's businesses, responsibilities for execution and daily operations are delegated to management. The Board gives clear directions as to management's power, and periodically reviews the delegations to management to ensure that they are appropriate and continue to be beneficial to the Group as a whole. The Board has delegated specific roles and responsibilities to the Executive, Remuneration, Nomination, and Audit and Risk Management Committees. All the Committees have specific terms of reference clearly defining their powers and responsibilities, and they are required by their terms of reference to report to the Board in relation to their decisions, findings or recommendations, and in certain specific situations, to seek the Board's approval before taking any action. Meetings of the Committees are convened as often as necessary and some decisions of the Committees are made by way of passing written resolutions. The Board has delegated its responsibilities to the Executive Committee to develop, review and monitor the policies and practices on corporate governance of the Group and make recommendations to the Board, to review and monitor the Company's policies and practices on legal and regulatory compliance, to review and monitor the code of conduct and ethical behaviour applicable to the Directors and employees and the training and continuous professional development of Directors and senior management, and to review the Company's compliance with the Code and disclosures in the corporate governance report. The Remuneration Committee was established in June 2005 and is chaired by Professor Wong Yue-chim, Richard, an Independent Non-Executive Director. Other members of the Committee are Dr. Li Ka-cheung, Eric, Mr. Kwan Cheuk-yin, William and Dr. Leung Nai-pang, Norman. All members are Non-Executive Directors and the majority of them are Independent Non-Executive Directors. The Company has adopted the model to delegate the determination of the remuneration packages of individual Executive Directors to the Remuneration Committee. The Committee is responsible for formulating and recommending remuneration policy to the Board and reviewing and making recommendations on compensation-related issues. The fees for the Directors are subject to the approval of the shareholders at the general meetings in accordance with the Articles of Association. The Committee, with the assistance of the Head of Internal Affairs, consults with the Chairman on its proposals and recommendations if necessary, and also has access to independent professional advice if necessary. The Committee is also provided with sufficient resources enabling it to perform its duties. The Committee's specific terms of reference are available on the websites of the Company and HKEx. The Nomination Committee is responsible for formulating policy and making recommendations to the Board on nominations and appointment of Directors, and Board succession. The Committee develops selection procedures for candidates, and will consider different criteria including appropriate professional knowledge and industry experience, as well as consult external recruitment professionals when required. The Committee also reviews the size, structure and composition of the Board and assesses the independence of the Independent Non-Executive Directors. The Committee is provided with sufficient resources enabling it to perform its duties and it can seek independent professional advice at the Company's expense if necessary. The Committee's specific terms of reference are available on the websites of the Company and HKEx. The Board is responsible for presenting a balanced, clear and comprehensible assessment of the Group's performance and prospects. The Directors also acknowledge their responsibility for preparing the financial statements that give a true and fair view of the Group's financial position on a going-concern basis, and for presenting a balanced, clear and understandable assessments in its annual and interim reports, other inside information announcements and other financial disclosures. All Board members are provided with monthly updates, including contracted property sales updates, projects launched, upcoming projects, leasing and hotel project updates, major investment projects under development and financial position, which give the Directors a balanced and understandable assessment of the performance, position and prospects of the Group. Management provides all relevant information to the Board, giving the members sufficient explanation and information they need to discharge their responsibilities. A statement by the external auditor of the Company in respect of its reporting responsibilities is set out in the Independent Auditor's Report. No former partner of the Company's existing auditing firm acted as a member of the Audit and Risk Management Committee within one year from ceasing to be a partner or to have any financial interest in the auditing firm. The Audit and Risk Management Committee monitors the audit and non-audit services rendered to the Group by the external auditor and ensures that the engagement of the external auditor in other non-audit services will not impair its audit independence or objectivity. An independence confirmation has been obtained from the external auditor which confirmed that during the course of its audit on the Group's consolidated financial statements for the year ended 30 June 2018 and thereafter to the date of the annual report, it is independent of the Group in accordance with the independence requirements of the Hong Kong Institute of Certified Public Accountants. The Group has diverse business activities in Hong Kong, Mainland China and Singapore and is exposed to different risks in a dynamic environment. Effective risk management is therefore essential for the long-term growth and sustainability of the businesses of the Group. The Board is responsible for the overall strategy and development of the Group's businesses; for setting its corporate goals and risk appetite; for establishing and maintaining sound and effective risk management and internal control systems to safeguard the Group's assets and stakeholders' interests; and for reviewing the effectiveness of the systems. The Board assesses the effectiveness of the risk management and internal control systems through the reviews performed by the Audit and Risk Management Committee, executive management and both internal and external auditors. It should be acknowledged that such systems are designed to manage rather than eliminate the risk of failure to achieve business objectives, and can only provide reasonable and not absolute assurance against material misstatement or loss. The internal control system aims at safeguarding assets from inappropriate use, maintaining proper accounts, ensuring compliance with laws and regulations, and enabling timely identification and management of key risks that may have impact on the Group. Management is primarily responsible for the design, implementation and maintenance of the risk management and internal control systems. The Group's internal control system includes a well-established organizational structure with clearly defined lines of responsibility and authority. Policies and procedures are laid down for its key business processes and business units covering project development, tendering, sales and leasing, financial reporting, human resources and computer systems. The Group's Code of Conduct, freely accessible on the Group's intranet, is maintained and communicated to all employees for compliance. In addition, a whistleblowing policy was established for our employees to raise concerns in confidence about suspected misconducts, malpractices or fraudulent activities relating to the Group. The identity of the whistleblower will be treated with the strictest confidence. 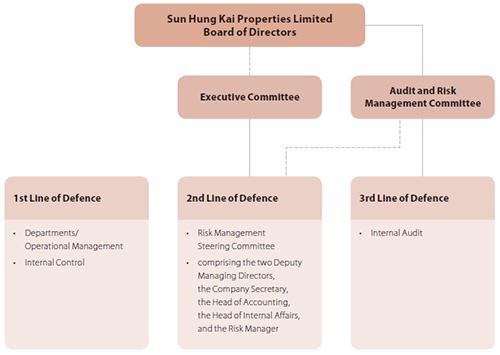 A substantial part of the Group's property portfolio is located in Hong Kong, and a substantial part of the Group's revenue is derived in Hong Kong. As a result, general state of the economy and the property market, legislative and regulatory changes, government policies and political conditions, interest rate changes, labour market conditions, and availability of financing in Hong Kong have a significant impact on the Group's operating results and financial conditions. For instance, profitability of property development business may be affected due to deteriorating economic conditions or intense competition from other developers and property owners. The government may introduce property cooling measures from time to time, which may have a significant bearing on the property market and adversely affect the Group's property sales performance, and financial condition. Further growth of the Group's property development business may also be impacted by the supply and price levels of land in Hong Kong. Rental levels in Hong Kong are subject to competition arising from supply in the primary sector. In addition to the economic and market conditions mentioned above, other domestic and external economic factors including but not limited to supply and demand conditions, and stock market performance may affect the Group's property investment business. The Group has material interests in residential and commercial property development and property investment in Mainland China and is therefore subject to the risks associated with China's property market. The Group's operations in Mainland China may also be exposed to the risks of policy changes, currency fluctuation, interest rate changes, demand-supply imbalance, changes in the overall economic conditions, competition in the labour market, and availability of financing, which may pose an adverse impact on the Group's business, financial condition or results of operations. The Group's operation is subject to a number of risk factors distinctive to property development, property investment, and property related businesses. Default on the part of our buyers, tenants and strategic business partners, inadequacies or failures of internal processes, people and systems, leakage of sensitive information by hacking or accidents, inadequate responses to negative events which may have adverse impact on reputation, or other external factors may have various levels of negative impact on the results of operations. Additionally, accidents may happen despite systems and policies set up for their prevention, which may lead to financial loss, litigation, or damage in reputation. The Group's Internal Audit Department, which has been established for more than 20 years, performs independent appraisal of the adequacy and effectiveness of the Group's risk management and internal control systems. The department has direct access to the Audit and Risk Management Committee and has rights to access all records, assets and personnel as stipulated in the Internal Audit Charter. The department follows a risk-based approach to formulate the audit plan that focuses on the top risks identified. The risks for departments and business units are assessed using the pre-determined risk criteria. The assessment results are consolidated and ranked from an enterprise-wide perspective. The Audit and Risk Management Committee reviews and approves annually the audit plan, which is formulated based on the risk assessment result. Summaries of major audit findings and control weaknesses, if any, are reviewed by the Audit and Risk Management Committee. The department monitors the follow-up actions agreed upon in response to recommendations. The Board through the Audit and Risk Management Committee reviewed the risk assessment results, and the risk management and internal control systems of the Group for the year ended 30 June 2018, including financial, operational and compliance controls. The review includes considering the internal control evaluations conducted by executive management and the internal and external auditors as well as the adequacy of resources, staff qualifications and experience, training programmes and budget of the Group's accounting, internal audit and financial reporting functions. Based on the result of the review, the Board considered that for the year ended 30 June 2018, the risk management and internal control systems of the Group were effective and adequate. The Board established a shareholders' communication policy setting out the principles of the Company in relation to shareholders' communications, with the objective of ensuring that its communications with the shareholders are timely, transparent, accurate and open. Information would be communicated to the shareholders mainly through the Company's corporate communications (such as interim and annual reports, announcements and circulars) and AGMs, as well as disclosure on the website of the Company. Interim reports, annual reports and circulars are sent to the shareholders in a timely manner and are also available on the websites of the Company and HKEx. The Company's website provides shareholders with its corporate information, such as principal business activities and major property projects, the development of corporate governance and the corporate social responsibilities of the Group. For efficient communication with shareholders and in the interest of environmental protection, arrangements are made to allow shareholders to elect to receive corporate communications of the Company by electronic means through the Company's website. Shareholders are provided with contact details of the Company, such as telephone hotline, fax number, email address and postal address, in order to enable them to make any queries that they may have with respect to the Company. They can also send their enquiries to the Board through these means. In addition, shareholders can contact the share registrar of the Company if they have any enquiries about their shareholdings and entitlements to dividend. The Company is committed to protecting the privacy right on all personal data collected from shareholders. When collecting personal data from the shareholders, the Company will specify in the relevant documents the purpose of collection and the use of personal data etc. Contact details are also provided to the shareholders for accessing and correcting their personal data. The AGM allows the Directors to meet and communicate with shareholders. The Company ensures that shareholders' views are communicated to the Board. The chairman of the AGM proposes separate resolutions on each substantially separate matter to the shareholders for their consideration and approval. Members of the Audit and Risk Management, Remuneration and Nomination Committees and the external auditor also attend the AGM to answer questions from shareholders. Simultaneous interpretation is provided to facilitate smooth and direct communication between shareholders and Directors. AGM proceedings are reviewed from time to time to ensure that the Company follows good corporate governance practices. The notice of AGM is distributed to all shareholders at least 20 clear business days prior to the AGM and the accompanying circular also sets out details of each proposed resolution and other relevant information as required to be disclosed under the Listing Rules. The chairman of the AGM exercises his power under the Articles of Association to put each proposed resolution to the vote by way of a poll. The procedures for conducting a poll are explained at the meeting prior to the polls being taken and the share registrar of the Company acts as the scrutineer for the vote-taking at the meeting. 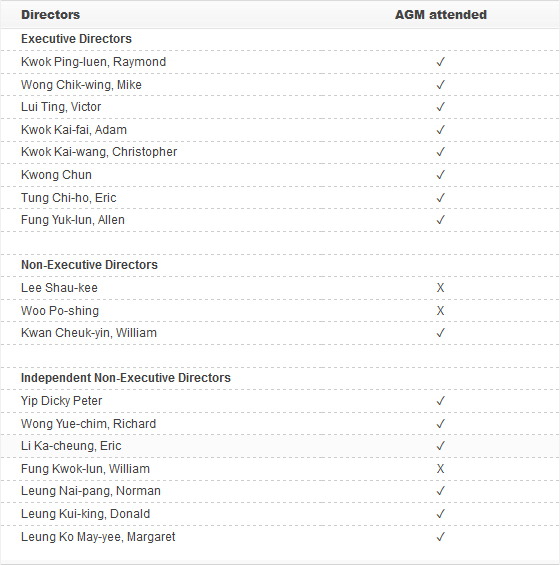 Voting results are available on the websites of the Company and the HKEx on the day of the AGM. The 2017 AGM was held on 9 November 2017 at the Company's headquarters with a strong participation by the shareholders. Businesses transacted at the 2017 AGM included the adoption of audited consolidated financial statements, the approval of final dividend, the re-election of Directors and fixing of the Directors' fees, the re-appointment of auditor, and the renewal of general mandates with respect to the buy-back of shares and the issue of shares. Shareholder(s) holding at least 5% of the total voting rights of all the shareholders of the Company having a right to vote at general meetings can send a request to the Company to convene a general meeting pursuant to Section 566 of the Companies Ordinance. The request must state the general nature of the business to be dealt with at the meeting and may include the text of a resolution that may properly be moved and is intended to be moved at the meeting. The request must be authenticated by the relevant shareholder(s) and sent to the Company in hard copy form or in electronic form. Besides, Section 615 of the Companies Ordinance provides that (i) shareholder(s) representing at least 2.5% of the total voting rights of all shareholders of the Company who have a right to vote on the resolution at the AGM; or (ii) at least 50 shareholders who have a right to vote on the resolution at the AGM may request the Company to circulate a notice of a resolution for consideration at the AGM. Such request must identify the resolution to be moved at the AGM and must be authenticated by the relevant shareholder(s) and sent to the Company in hard copy form or in electronic form not later than six weeks before the relevant AGM or if later, the time when the notice of the AGM is despatched. During the year ended 30 June 2018, no amendment was made to the Articles of Association. The latest version of the Articles of Association is available on the websites of the Company and HKEx.